Methods:Retrospective interventional case series in which 23 patients with microbiologically proven fungal keratitis presenting with anterior chamber exudates or hypopyon who presented between January 2009 & June 2013 were chosen. Depth of the infiltrate scored from 1 to 3 based on depth of involvement and those with infiltrate depth score of 2 or 3 were included. Patients with perforated corneal ulcers, infectious keratitis co-existent with any other organism or endophthalmitis were excluded. Demographic/Clinical data was recorded. All patients underwent anterior chamber evacuation of exudates. Primary outcome measure was complete resolution of infection defined as resolution with scar formation without subsequent recurrence for 1 month. Outcome was ‘failure’ if patient needed therapeutic keratoplasty or evisceration. Secondary outcome measure was comparative sub-group analysis between patients who had successful or failed outcome (group 1/2). Conclusions:Evacuation of anterior chamber exudates is of little help in patients with larger or deeper infiltrates and therapeutic keratoplasty is usually required. Fungal keratitis is the leading cause of mono-ocular blindness worldwide with a reported incidence varying from 6-50%, significantly more in tropical regions than the western world [1,2]. Patients of fungal keratitis may present with a variety of clinical presentations. Anterior chamber inflammation in fungal keratitis could be either in the form of thick hypopyon or dense focal, fibrinous exudates stuck to the endothelium. Hypopyon in keratomycosis, unlike bacterial keratitis, usually contains fungal elements and is difficult to treat because of poor corneal penetration of most topically applied drugs [3,4]. Anterior chamber irrigation has been described as a treatment modality along with penetrating or lamellar keratoplasty . Twenty patients received anterior chamber irrigation combined with penetrating or lamellar keratoplasty treatment in their study and only 1 case suffered recurrence of fungal keratitis. However, the question of whether the infection was eradicated due to anterior chamber irrigation or due to the keratoplasty still remains unanswered. In this communication we analyse the efficacy of anterior chamber evacuation of exudates as an adjunct in the management of deep keratomycosis presenting with anterior chamber exudates or endoexudates. To the best of our knowledge and literature search, this is the first such study. This retrospective interventional case series was approved by the Institutional Review Board. A written informed consent was obtained from all patients prior to the surgical procedure they underwent. All patients with microbiologically proven fungal keratitis who presented with exudates in the anterior chamber (AC) between January 2009 and June 2013 were selected. Depth of the infiltrate was then given a score from 1 to 3 based on whether the infiltrate extended upto the anterior, middle or posterior 1/3 of the corneal stroma. Patients with infiltrate depth score of 2 or 3 were included in the study. Exudates in the AC could either be in the form of a hypopyon or endoexudates-inﬁltrates or plaque present on the endothelium, or both. Patients who presented with superficial fungal ulcer with a depth score of 1, perforated corneal ulcers, infectious keratitis co-existent with any other organism, endophthalmitis or any other ocular pathology were excluded. The clinical and microbiological data was retrieved from the medical records. At initial presentation, the clinical data recorded were age, gender, history of any trauma or prior ocular surgery, systemic history of diabetes mellitus, duration of the illness at presentation and clinical characteristics of the infiltrate including its size, depth, presence of hypopyon or endoexudate. Infiltrate size was measured in area in 2 dimensions and was graded as mild (< 2mm2), moderate (2-6mm2) or severe (> 6mm2). These were given score of 1, 2 and 3 respectively for the sub-group analysis. Depth of the infiltrate was scored from 1-2, as stated earlier. Special emphasis was given to note the presence of hypopyon or endoexudate. All patients underwent microbiological corneal scraping as per the institutional protocol . Smears were prepared for potassium hydroxide (KOH) wet-mount and Gram stain. Subsequently, inoculations were done on blood agar, chocolate agar and Sabouraud’s dextrose agar (SDA). Once the fungal etiology was established, Natamycin 5% eye drops every half hourly were started along with Atropine 1% eye drops 3 times a day in all patients. Systemic Ketoconazole 200 mg twice daily was also given to all patients. Patients who underwent anterior chamber irrigation of the hypopyon or endoexudates were included in the study. All patients were prescribed hourly topical natamycin 5%, topical atropine sulphate (1%) 3 times a day and systemic ketoconazole (200 mg) twice a day. The primary outcome measure was complete resolution of infection. Success was defined as resolution of infection with scar formation without subsequent recurrence up to 1 month. Outcome was noted as a ‘failure’ if the patient required therapeutic keratoplasty for eradication of infection or the infection could not be controlled and the eye had to be eviscerated. The patients were then divided into two groups (1 & 2) based on whether the outcome was a success or failure. Secondary outcome measure was to assess the possible differences in these 2 groups at presentation. All the descriptive parameters were noted in the form of mean and standard deviation if the data was parametric or in the form of median with range if the data was non-parametric. An unpaired t-test was used in these cases if the data followed normal distribution; otherwise Mann-Whitney U test was applied. Chi-square test or Fisher Exact test (http://www.quantitativeskills.com/sisa/statistics/fisher.htm) was applied, depending upon the sample size, to all categorical variables to assess the possible difference in the different groups at presentation. 95% confidence limits for proportions or mean were calculated for each variable using the online calculator on http://www.mccallum-layton.co.uk/stats/Home.aspx (accessed September 2013). P<0.05 was considered to be statistically significant in each case. During the study period, approximately 1900 patients presented to us with smear or culture proven fungal keratitis cases. Of these, 23 patients were included in the study after the application of the inclusion and the exclusion criteria. Demographic and clinical details are enumerated in Table I. The mean age of the patients was 55.21 + 13.7 (median: 55, range 16-79) years. Male: female ratio was 15:8. A history of prior ocular trauma or surgery was present in 13 (56.52%) patients and 4 (17.39%) patients had diabetes mellitus at presentation. Mean duration of illness prior to presentation was 33.86 + 28.23 (median: 30, range: 4-120) days. All patients were microbiologically positive for fungus, smears were positive in 20/23 (86.9%) cases and cultures were positive in 12 (52.17%) cases. Corneal infiltrates were moderate in 13 cases and severe in 10 cases. None of the infiltrates were less than 2 mm2 in size. The mean infiltrate size score was 2.43 + 0.5 (median: 2, IQR 1) and mean infiltrate depth score was 2.6 + 0.5 (median: 3, IQR 1). Six patients presented with superficial scarring and deep infiltrate with endoexudates. These patients were given a score of 3 as they involved the posterior 1/3 of the corneal stroma. Hypopyon was seen in 20 (86.9%) cases and endoexudates were seen in 15 (65.21%) cases. The mean duration after presentation when anterior chamber wash was done was 8.39+ 10.44 (median:5, range: 1-40) days. Intracameral antifungals were administered at the end of the surgery in 13 (56.35%) cases; amphotericin B 0.15% and voriconazole 0.05% were given in 11 and 2 cases respectively. Outcome assessment was done at a mean duration of 39.73 + 46.83 (median: 14, range: 1-170) days after the anterior chamber wash was done. Eight (34.78%) patients had successful outcome with resolution of infection and 15 (65.21%) patients had a failure of outcome. The intervention was repeated in 3 patients and 5 patients required supplementation with cyanoacrylate glue. However, the ultimate outcome was a failure in all these patients. Sub-group analysis was done to find the possible differences at presentation between the patients who had a successful (group 1) or a failed (group 2) outcome (Table 2). Though a history of prior ocular trauma was more common in group 1 (7/8) than group 2 (6/15) with a p value in the significant range (p=0.03), it had overlapping 95% confidence intervals (64.58-110.42% and 15.21-64.79%)). The patients who had a failed outcome (group 2) had statistically larger (p=0.02 95% CI: 1.86-2.34& 2.35-2.85) and deeper (p=0.008; 95% CI: 1.93-2.57& 2.6-3) corneal infiltrates. Mean duration, in days, after the surgical intervention at which the outcome was established was statistically shorter in group 2 than group 1 (p<0.0001; 95%CI: 5-23.52 & 54.85-120.15). Other demographic and clinical features were found to be statistically comparable (p>0.05) with overlapping 95% confidence intervals. Figure 1 shows a composite of slit lamp photos taken at presentation in cases who had a successful (top, 1a-c) and a failed outcome (bottom, 1d-f). Figure 1 shows the pre-operative, post-operative day 1 and post-operative day30 images of cases with successful (case 4 – top and case 9 – middle) and failure (case 8 – bottom) as clinical outcome. Though a successful outcome, the visual acuity in case 9 was limited due to corneal scarring. (I think you can mention this in legend rather than text). Fungal keratitis accounts for more than 50% of all ocular mycoses in the tropical regions of the world . Two basic forms of fungus have been recognized: ﬁlamentous fungi (Fusarium and Aspergillus) which commonly occurs in tropical and subtropical zones and keratitis due to yeast-like fungi (Candida) . They present a diagnostic and therapeutic challenge because they mimic other types of stromal inﬂammation and because their management is restricted by the limited availability of effective antifungal agents and the extent of their penetration into the cornea. Filamentous fungal keratitis presents in variety of clinical presentations. They may also present with an intact epithelium and a deep stromal infiltrate, hypopyon or endoexudate [9-11]. Lalitha P et al. found that the presence of hypopyon (p=0.003) was a predictor for failure of treatment . Xu et al. found that positivity of fungal culture for hypopyon was associated with increased duration of symptoms and larger lesion size. Further, the reported that surgical intervention was more common and hypopyon was a risk factor for recurrence of fungal keratitis after corneal transplantation . Intracameral [14,15] and Intracorneal  amphotericin B have been found to be useful in the management of deep keratomycosis. Since the discovery of voriconazole, it has been used widely in the management of ocular and systemic mycotic infections  Earlier reports of its systemic, [18,19] intravitreal [20-22] and topical  administration exist in literature. However, cornea specialists have explored alternate route of administration into the corneal stroma. Table 2: *CI-Confidence Intervals. Patients who had a failed outcome (group 2) had statistically larger (p=0.02) and deeper (p=0.008) corneal infiltrates. Mean duration after the surgical intervention at which the outcome was established was statistically shorter in group 2 than group 1 (p<0.0001). Though, a history of trauma was seen statistically significantly more in patients of group 1 (p=0.03), the two groups had overlapping 95% confidence intervals. Other demographic and clinical features were found to be statistically comparable (p>0.05) with overlapping 95% confidence intervals. Figure 1: Composite of slit lamp images taken at presentation of different cases that had outcome as a success (a-c) and failure (d-f). Prakash et al. used intrastromal voriconazole as a therapeutic adjunct in management of 3 cases of deep fungal keratitis and found it to be safe and effective  Other reports of intrastromal, intracameral and topical administration of voriconazole in different combinations have further been reported [25-29] Anterior chamber evacuation of hypopyon as a therapeutic modality has been shown in combination with corneal transplantation and was found to be safe and effective  In this communication we study the efficacy of anterior chamber evacuation of hypopyon or endoexudates as an adjunct in management of deep keratomycosis presenting with hypopyon or endoexudates. To the best of our knowledge and literature search, this is the first such report. In our series of 23 cases, we found that deep fungal keratitis presenting with endoexudates or hypopyon presented at a mean age of 55.2 years and was more common in males, findings similar to those found by Lalitha et al  and Ramakrishnan et al . Fungal keratitis has been known to be associated with a prior history of ocular trauma9 as was seen in our series. The mean duration of presentation in our series was fairly prolonged and was 33.8 days. This could be possibly because ours is a tertiary care referral centre and most patients had received primary care by the local ophthalmologists. Only microbiologically proven fungal keratitis cases were included in the study. Mean score depth of the infiltrates in our study was 2.6. It meant that infiltrate in most patients involved mid (9/23) or posterior (14/23) stroma. Six patients (6/23) who presented with superficial scarring and deep infiltrate with endoexudates did so because they had been partially treated with topical antifungals prior to presentation. Either hypopyon (20/23) or endoexudates (15/23) were present in all cases. Though, the mean duration after presentation at which anterior chamber wash was done was 10 days, it was done from day 1 to 40 in different patients due to different treating surgeons with varying thresholds for the intervention. Similarly whether an intracameral antifungal agent was to be administered and its choice, either amphotericin B or voriconazole, also depended upon the treating surgeon. The outcome assessment was done when the infection healed without recurrence upto 1 month in the cases that had a successful outcome or the day when outcome failed and a therapeutic intervention was needed. We found that evacuation of anterior exudates as an adjunct in the management of patients of deep fungal keratitis presenting with endoexudates was successful in achieving resolution of infection in 8/23 cases (34.78%). Sub-group analysis of patients who had outcome as a success (group 1, n=14) or failure (group 2, n=17) revealed that patients who had larger and deeper infiltrates at presentation did not respond to evacuation of anterior chamber exudates and ultimately needed keratoplasty.. Though the intervention helped in the resolution of infection in patients who presented with anterior stromal infiltrates with hypopyon or smaller & superficial infiltrates in this series, doubts regarding whether it was really required in these cases exists. Such small infiltrates might have responded only to concurrent use of topical anti-fungals. Hence whether evacuation of exudates was needed and whether it was useful can only be answered by a control trail. None of the other clinical or demographic factors were found to be different statistically in these two groups. Also patients with a successful outcome required persistent prolonged medical treatment for a mean time of 70 days after surgical intervention. Patients in which the intervention failed showed the outcome at a much shorter period (13 days). This meant that if the patient was supposed to have a failed outcome, it could be known much earlier and might help in planning of further intervention in the form of therapeutic penetrating keratoplasty. Hence authors recommend against performing this intervention in patients with larger and deeper corneal infiltrates and hypopyon and recommend keratoplasty as the primary surgical treatment. The results of this study should be however interpreted taking into consideration the limitations. Firstly, this was a retrospective study with all its inherent limitations. Secondly, different surgeons were involved in the management of these cases, each with varied thresholds for surgical intervention. The choice and the use of intracameral antifungal agent also varied in our study. Thirdly, it would also have been ideal if the size of the hypopyon in each case was measured. But due to the retrospective nature of the study, this data could not be retrieved. Further, though it is known that fungus can penetrate the intact cornea, microbiological data on aqueous humor retrieved during surgery could have been helpful to confirm whether the hypopyon was infective or sterile. Finally, a control group consisting of patients of fungal keratitis in whom anterior chamber wash was not done would have been ideal for comparison. Since, fungal keratitis presenting with hypopyon or endoexudates is a common occurrence in a cornea clinic, a prospective randomized study with a larger sample size taking care of these limitations would be ideal. To conclude, we present a pilot study in which we evaluated the efficacy of evacuation of anterior chamber exudates in the management of deep fungal keratitis. We found that the intervention was not useful in patients presenting with larger and deeper infiltrates. Also, patients who had a failed outcome did so much earlier than others. This might help to plan a definitive therapeutic intervention earlier in them. However, further prospective studies with strict inclusion criteria, a larger sample size and a control group would provide conclusive results. Whitcher JP, Srinivasan M, Upadhyay MP (2001) Corneal Blindness: A global perspective. Bull World Health Organ 79(3): 214-221. Gonzales CA, Srinivasan M, Whitcher JP, Smolin G (1996) Incidence of corneal ulceration in Madurai district, south India. Ophthalmic Epidemiol 3(3): 159-166. Abad JC, Foster CS (1996) Fungal keratitis. Int Ophthalmol Clin 36(3): 1-15. O’Day DM, Head WS, Robinson RD, Clanton JA (1986) Corneal penetration of topical amphotericin B and natamycin. Curr Eye Res 5(11): 877-882. Gao H, Wang T, Zhang J, Li SX, Shi WY (2010) Clinical application of irrigation in therapeutic keratoplasty for suppurative keratitis with severe hypopyon. Zhonghua Yan Ke Za Zhi 46(5): 400-404. Rautaraya B, Sharma S, Kar S, Das S, Sahu SK (2011) Diagnosis and Treatment Outcome of Mycotic Keratitis at a Tertiary Eye Care Center in Eastern India. BMC Ophthalmology 11: 39. Srinivasan R, Kanungo R, Goyal JL (1991) Spectrum of oculomycosis in South India. Acta Ophthalmol 69(6): 744-749. Jones DB (1980) Strategy for the initial management of suspected microbial keratitis. In: Barraquer JI, Binder PS, Buxton JN, Fine M, Jones DB, Laibson PR, et al. (eds). Symposium on Medical and Surgical Diseases of the Cornea. Transactions of the New Orleans Academy of Ophthalmology. Mosby: St Louis, 1980, pp. 86-119. Thomas PA (2003) Fungal infections of the cornea. Eye (Lond) 17(8): 852-862. Kaufmann HE, Wood RM (1965) Mycotic keratitis. Am J Ophthalmol 59: 993-1000. Sevel D, Kassar B (1973) Suppurative keratitis and fungal keratitis. Trans Ophthalmol Soc N Z 25: 228-232. Lalitha P, Prajna NV, Kabra A, Mahadevan K, Srinivasan M (2006) Risk Factors for Treatment Outcome in Fungal Keratitis. Ophthalmology 113(4): 526-530. 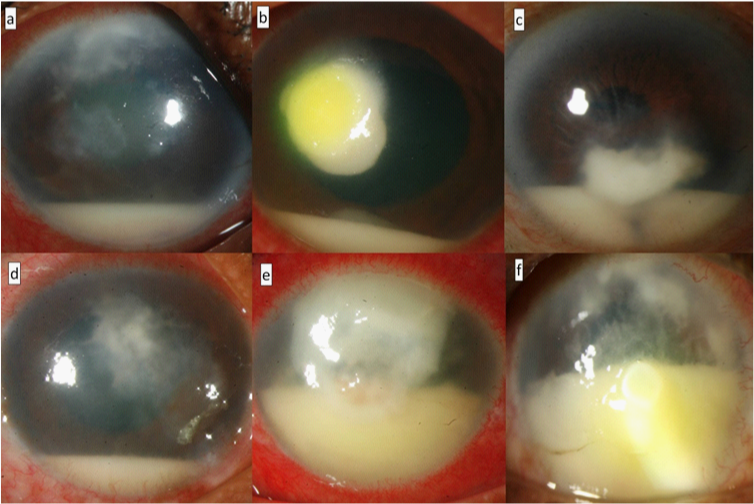 Xu LJ, Song XS, Zhao J, Sun SY, Xie LX (2012) Hypopyon in patients with fungal keratitis. Chin Med J (Engl) 125(3): 470-475. Kaushik S, Ram J, Brar GS, Jain AK, Chakraborti A, et al. (2001) Intracameral Amphotericin B: Initial Experience in Severe Keratomycosis. Cornea 20(7): 715-719. Yoon KC, Jeong IY, Im SK, Chae HJ, Yang SY (2007) Therapeutic Effect of Intracameral Amphotericin B Injection in the Treatment of Fungal Keratitis. Cornea 26(7): 814-818. Garcia-Valenzuela E, Song CD (2005) Intracorneal Injection of Amphothericin B for Recurrent Fungal Keratitis and Endophthalmitis. Arch Ophthalmol 123(12): 1721-1723. Hariprasad SM, Mieler WF, Lin TK, Sponsel WE, Graybill JR (2008) Voriconazole in the treatment of fungal eye infections: a review of current literature. Br J Ophthalmol 92(7): 871-878. Aydin S, Ertugrul B, Gultekin B, Uyar G, Kir E (2007) Treatment of two postoperative endophthalmitis cases due to Aspergillus flavus and Scopulariopsis spp. with local and systemic antifungal therapy. BMC Infect Dis 7: 87. Breit SM, Hariprasad SM, Mieler WF, Shah GK, Mills MD, et al. (2005) Management of endogenous fungal endophthalmitis with voriconazole and caspofungin. Am J Ophthalmol 139(1): 135-140. Chen FK, Chen SD, Tay-Kearney ML (2007) Intravitreal voriconazole for the treatment of endogenous endophthalmitis caused by Scedosporium apiospermum. Clin Exp Ophthalmol 35(4): 382-385. Huynh TK, Lee LR, Ellis D (2007) Late-onset post-traumatic Phaeoacremonium parasiticum endophthalmitis. Clin Exp Ophthalmol 35(4): 366-368. Durand ML, Kim IK, D’Amico DJ, Loewenstein JI, Tobin EH, et al (2005) Successful treatment of Fusarium endophthalmitis with voriconazole and Aspergillus endophthalmitis with voriconazole plus caspofungin. Am J Ophthalmol 140(3): 552-554. Marangon FB, Miller D, Giaconi JA, Alfonso EC (2004) In vitro investigation of voriconazole susceptibility for keratitis and endophthalmitis fungal pathogens. Am J Ophthalmol 137(5): 820-825. Prakash G, Sharma N, Goel M, Titiyal JS, Vajpayee RB (2008) Evaluation of Intrastromal Injection of Voriconazole as a Therapeutic Adjunctive for the Management of Deep Recalcitrant Fungal Keratitis. Am J Ophthalmol 146(1): 56-59. Tu EY (2009) Alternaria Keratitis: Clinical Presentation and Resolution with Topical Fluconazole or Intrastromal Voriconazole and Topical Caspofungin. Cornea 28(1): 116-119. Sharma N, Agarwal P, Sinha R, Titiyal JS, Velpandian T, et al. (2011) Evaluation of intrastromal voriconazole injection in recalcitrant deep fungal keratitis: case series. Br J Ophthalmol 95(12): 1735-1737. Siatiri H, Daneshgar F, Siatiri N, Khodabande A (2011) The Effects of Intrastromal Voriconazole Injection and Topical Voriconazole in the Treatment of Recalcitrant Fusarium Keratitis. Cornea 30(8): 872-875. Haddad RS, El-Mollayess GM (2012) Combination of intracameral and intrastromal voriconazole in the treatment of recalcitrant Acremonium fungal keratitis. Middle East Afr J Ophthalmol 19(2): 265-268. Mittal V, Mittal R (2012) Intracameral and Topical Voriconazole for Fungal Corneal Endoexudates. Cornea 31(4): 366-370. Ramakrishnan T, Constantinou M, Jhanji V, Vajpayee RB (2013) Factors Affecting Treatment Outcomes With Voriconazole in Cases With Fungal Keratitis. Cornea 32(4): 445-449.